This is Baldwin Station in historic Sykesville, Maryland. Built in 1880s, it is the second oldest railroad station in the United States and one of the most beautiful examples of Victorian Architecture. 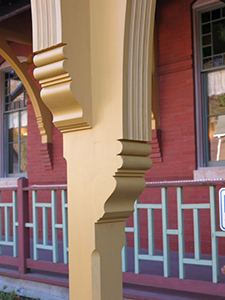 We were hired to restore and repaint the exterior woodwork. The job was a challenge because of the poor condition and heavy build-up of existing paint on most surfaces. 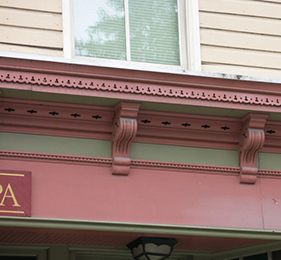 In particular, we wanted to remove paint build-up that almost concealed beading and molding detail of the large ceiling corbels. 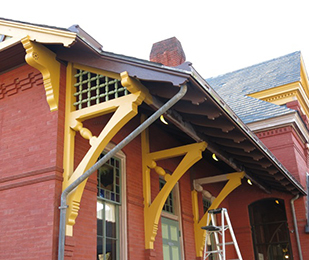 Our team did a spectacular job carefully removing paint and revealing the outstanding woodwork design and detailing. We have special techniques to ensure this beautiful woodworking is not damaged in the restoration process. 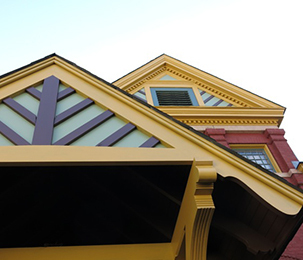 We have restored and repainted many older homes and antiques homes in D.C., MD. & VA. over the years. Please call us for free consultation on your home or project. Our prices are very reasonable and competitive; our men are long term employees with many years of experience. They are truly craftsmen.